Scallops with garlic and Swiss chard, new recipe!! Fish is such a big part of my cooking. Healthy, versatile and easy to prepare. Wanting a change from the usual suspect, I purchased some scallops and I am so excited to all the recipes that I can experiment with it. For my first time attempt with scallops I decided to go the easy route by wrapping bacon around them and sautéing them. Introducing a new fish opened the door to a new vegetable, Swiss chard. Love Swiss chard however I never prepared it for my family. The test challenge was on and the reception was warm with huge smiles and thumbs up given. Of course I added garlic, and garlic makes every thing taste good. To soften and remove the slight bitterness of the Swiss chard, I first removed the center core, and then blanched the chopped leaves for a couple of minutes in boiling salted water. The garlic needs to be soft when cooked with the oil but not brown. The scallops were delicious, tender and super tasty. The combination with the Swiss chard was a perfect balance. Bring a large pot of salted water to a boil. Add the chopped Swiss chard and cook for 2 minutes. Drain and set aside. Season the scallops with salt and pepper. Wrap each scallop with bacon and secure with a toothpick. Heat 1 tablespoon of olive oil in a large skillet over medium high heat and seat the scallops for 3 minutes on each side. The scallops should be golden on the outside and springy to the touch. In another large skillet over medium high heat add 1 tablespoon olive oil. When the oil is hot add the garlic slices and cook them until soft but not brown, 2 minutes. Add the Swiss Chard and cook for another 3 minutes. Set aside. 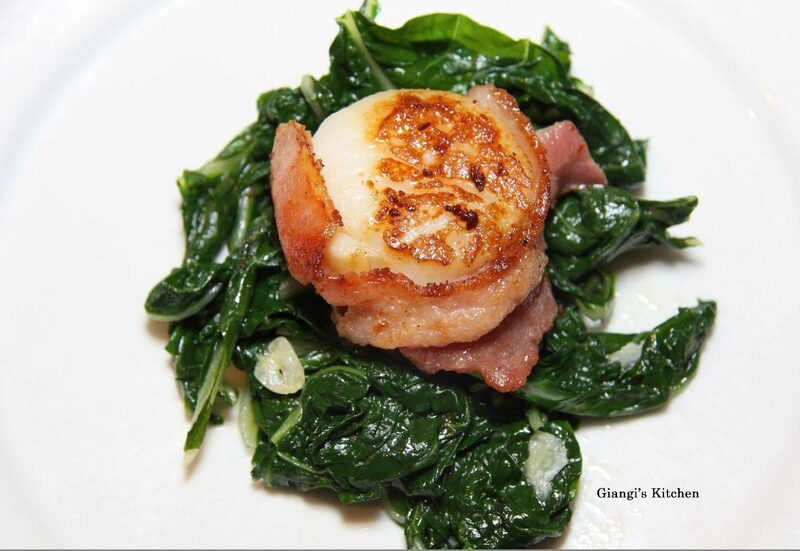 Place the Swiss chard in the middle of a plate and top with the scallops.